The last day of our 3-day trip somehow managed to peak it all. What exactly it was is hard to say, but the fact that the other guide had only been on that trail once, several years ago and coming from the opposite direction, must have been part of it. For her it felt like she was going to explore a new trail and for me, well, I was exploring unkown terrain, as so many times before. We had discussed our options thouroughly the day before and again in the morning – the idea coming from Kevan himself – who believed in our knowledge and skills as guides. And so did I, between the other guide, who had a good understanding of the horses few limitations when it comes to this terrain and would make sure to avoid places with bedrock and other tricky stuff; and me, who only knew how amazing our horses are, but also had good land and map reading skills to round it up; skills I had acquired while travelling around the world. In a way every place is 'unknown terrain' and exploring such has always been a pleasure to me. 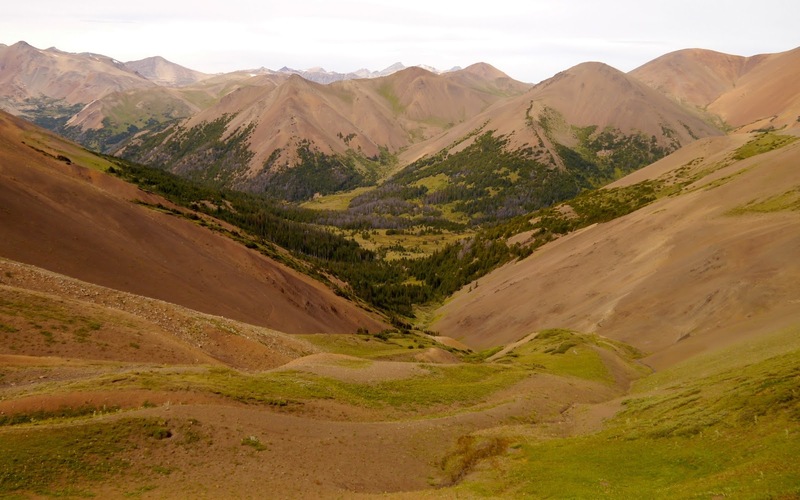 Though none of these places were true wilderness areas with grizzly bears, wolves and cougars walking around. After packing up we left Tyax camp and soon turned onto Little Paradise Trail leading us into another valley. I'll try to make it short – it was beautiful, just that. Once again we were surrounded by red scree slopes all around us and one of these we had to climb. Looking at the map it was easy to figure where we were heading, much easier than finding the actual trail which was not always obvious. Soon we were zig-zagging up scree slopes and after a last admiring look back, I faced forward. Excited as we were, we had a short 'race' to the top of the ridge, each of us wanting to be the first to see the new 'unknown land'. It blew us away. Right in front of us towered a massive volcanic rock face – Relay Mountain. As soon as I could withdraw my eyes, I pulled out the map to give every landmark a name. To our left was Red Hill, an interesting name for a mountain that seems rather pale in comparison to the red scree slopes of Mount Davidson or the ones we had just came up. To our right was Mt. Cunningham's impressive peak. In the middle of it all and right in front of us was a huge green plateau. Such a sight is hard to forget and the other guide remembering the way now, lead us along the ridge towards Mt. Cunningham. Though secretly wishing to stay high and continue towards the peak – a hope I knew was impracticable as we only had so much time to get to our pick up place during daylight hours – she soon was leading us down into the valley. The way down was sweetened by lovely Old-man-whisker's patches which made me forget all about my disappointment. After crossing a creek our horses climbed up the next ridge. One of the scree slopes we crossed there will forever stay in my memory, for it's stunning view towards Relay Mt. and for it's steepness, but our Cayuse horses walked on, hardly caring at all and we reached the last pass safely. From here on we would constantly lose elevation. The initial climb down though turned out to be quite a challenge as we had to find a way down, while avoiding dangerous patches of bedrock. This was my guide's time to shine and she fearlessly walked us across an even more steep slope than the one we had just passed, but that was not all of it. Landslides had brought down massive rocks through which we now had to find our way, crossing several creeks who had dug deep ditches into the scree. Our exploration had turned into a real adventure, a wrong decision could easily have ended up with someone getting hurt or us losing precious time... but we made it through with grace, all the while enjoying the rare sight of Castle Peak's back side – which is, in case you are curious, just as stunning as it's front side. When we had made it through, it was time to find the real trail again. Easier said than done, as the way we went is one of the less travelled trails in the Park. Now it was our experienced horses' turn to shine and they didn't disappoint us. They of course had been here before and helped us a great deal whenever we were unsure and when one of the horses seemed to be unsure (or distracted by food), we would switch and see where the other horse would go. It was amazing teamwork! 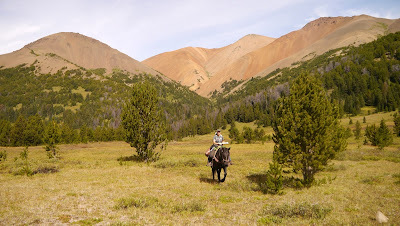 Soon we crossed Paradise Creek, rode around the base of Cardtable Mountain, still bushwhacking to avoid deadfalls once in awhile, then crossing the creek again and again, riding through thick forest inbetween or through meadows with grass a meter or more high - a horse's paradise! Allowing our trusty Cayuse horses to snack along the way, we continued until we reached the trailhead. Here we were greeted by a great view of Tepee Mountain – the first time I saw it. We now followed an old deactivated logging road back to it's beginning. Again we were walking through high grass; a happy sight to the horses and to me, as I like to see places where nature is claiming back it's original place. After reaching our destination and after all was done and we were on our way back home, I found time to reflect on the last days and suddenly I remembered, this is what life is supposed to be like – full of exciting challenges and always providing chances to explore unknown terrain. With this and a quote of Kevan – he always reaches his destination, no matter how impossible the way seems! – I want to end my little tale: 'I point my horse in one direction, and off I go'.